The Mummy changed the face of mummy flicks. From the 1930s on, mummy movies have been a horror movie staple, but they were relegated firmly to the B list. They tended to be low budget. It didn't cost much to make a couple faux-stone chambers and wrap a guy in gauze. But with 1999's The Mummy, mummy movies moved to the A list of major theatrical releases. Advances in special effects certainly helped. The shuffling actor swathed in gauze could now be replaced by a gruesomely decayed walking corpse, morphing slowly into the appearance of normal life as he sucked the life out of a series of hapless extras. Nor are special effects all that separates The Mummy from its B-list past. We've also left the sound stages and interiors for the wide open spaces of 1920s Egypt, complete with hordes of extras and herds of camels. 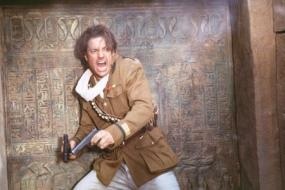 Rick O'Connell (Brendan Fraser) is a soldier of fortune, recently of the French Foreign Legion. Evelyn Carnahan (Rachel Weisz) is an Egyptologist and a librarian. Not the sort of people who'd usually have much use for one another. But in an earlier Foreign Legion adventure in Egypt, Rick had stumbled across the location of the legendary lost city of Hamunaptra, a place that Evelyn very much wants to find. Evelyn hires Rick to guide her and her wastrel brother Jonathan (John Hannah) to Hamunaptra. Her goal is to find the mythic Egyptian Book of the Living. The fact that the lost city would probably also be teeming with wealth untold, well, that's just gravy. As might be expected on this sort of adventure, Evelyn and Rick scrap and spar, to let us know that romance is developing. Evelyn is spunky. She is also remarkably clumsy, but come on - brains and beauty, and you want gracefulness, too? There's competition in the search for Hamunaptra. A group of American treasure-hunters is after the same goal, more interested in that wealth untold than any old book. The two teams arrive at the lost city simultaneously and set up rival explorations of the ruins. Unfortunately for them all, there's something else in those ruins besides a mythic book and the wealth untold. Something... unspeakable. Buried in the ruins is the tomb of Imhotep, the treacherous magician-vizier who seduced his pharaoh's mistress and assisted her in assassinating him. 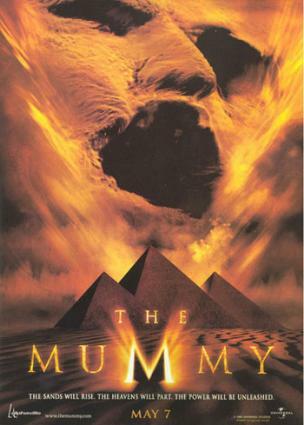 The pair were caught, and the mistress Anck-su-Namen (Patricia Velasquez) committed suicide, while Imhotep (Arnold Vosloo) was mummified alive and buried with a curse. The blundering Americans manage to accidentally (!) raise Imhotep from the grave. And man, he has not aged well! Little more than a walking skeleton with a few rags of skin left, but he's a man with a plan. Imhotep begins by taking on those who disturbed his grave, and with each person he kills, he becomes more substantial and his magical powers increase. Soon he will be unstoppable. The other part of his plan involves bringing back his lost love Anck-Su-Namen, and for that he'll need a human body to accept her spirit. Evelyn will fill that role quite nicely. Can Rick save Evelyn from this horrible fate? Will Evelyn admit her feelings for Rick? Will Jonathan ever do anything actually useful? In true action-adventure fashion, the heroes win - but there are some hair-raising adventures along the way. The Mummy is rated PG-13 and is probably not suitable for younger children. There is a lot of violence, fairly cartoonish so as not to be too disturbing to adults and teens, but that half-man half-corpse character could be the stuff of nightmares for the younger crowd. The Mummy was directed by Stephen Sommers and scripted by Stephen Sommers, from a story by Stephen Sommers and Lloyd Fonvielle & Kevin Jarre.